Peel pears and leave whole with stem intact, use immediately after peeling so pears do not oxidize. Add 2 cups of Riesling, 3 oz. of Pomp & Whimsy, one piloncillo (or 3 oz. brown sugar if unavailable), one stick of cinnamon, 4 cloves, 4 juniper berries and pears in a saucepan large enough to accommodate all the pears, but just barely. Add water to cover pears. Bring to a boil and reduce immediately to a low simmer. Simmer for 15-20 minutes. Make one extra “tasting” pear. This is the one you will check the texture. Remove pears after 15 minutes, check texture. Pears should be still a little firm but not hard (not soft either). Continue to cook if needed to achieve desired texture. Remove pears and allow to cool. Turn pot up (without pears) to a full boil. Boil until reduced by half. Remove from heat, cool and add Pomp & Whimsy to taste. Can me made up to 3 days in advance. Store pears in the refrigerator with the syrup you have made. 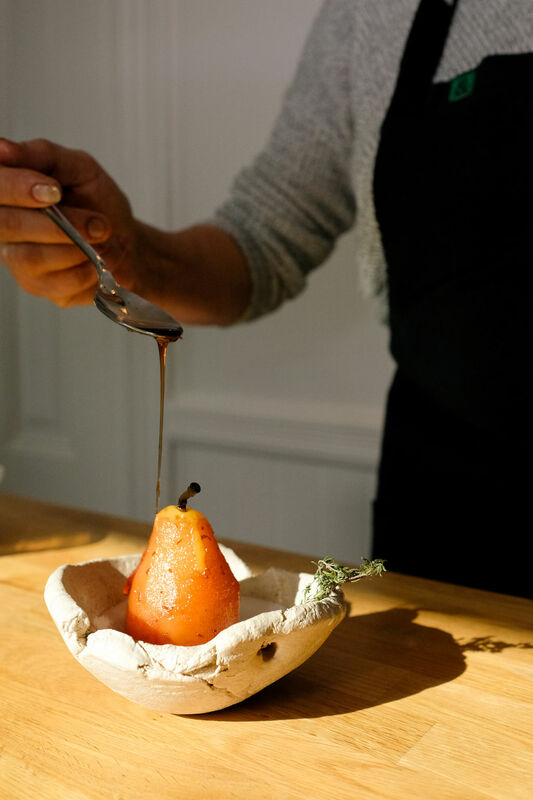 To serve, if pears are small, serve whole, if larger, cut in half (tip to base) leaving the stem on but using a small spoon, “carve” out the core, that’s the small area where the pits are, after you have cut the pear in half. Serve with a mint or tarragon leaf. 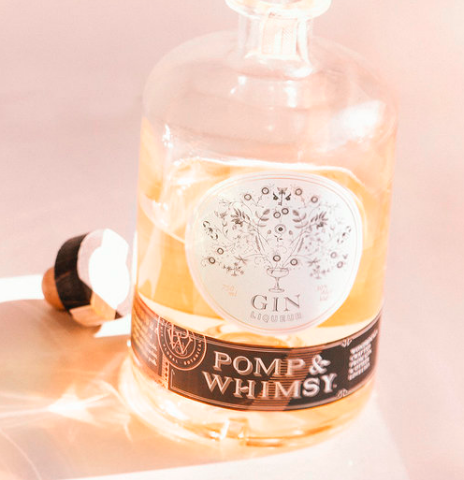 Pomp and Whimsy brings modern sensibilities to the tradition of gin making, by infusing classically distilled gin with a natural, delightfully flavorful botanical liqueur.